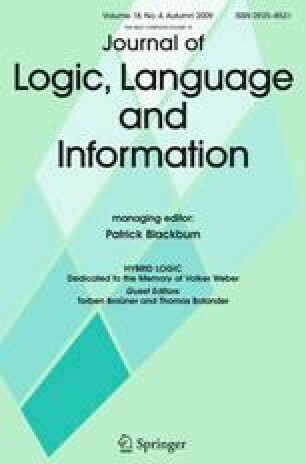 This paper examines and classifies the computational complexity of model checking and satisfiability for hybrid logics over frames with equivalence relations. The considered languages contain all possible combinations of the downarrow binder, the existential binder, the satisfaction operator, and the global modality, ranging from the minimal hybrid language to very expressive languages. For model checking, we separate polynomial-time solvable from PSPACE-complete cases, and for satisfiability, we exhibit cases complete for NP, PSpace, NExpTime, and even N2ExpTime. Our analysis includes the versions of all these languages without atomic propositions, and also complete frames. Mundhenk, M., Schneider, T., Schwentick, T., & Weber, V. (2005). Complexity of hybrid logics over transitive frames. In H. Schlingloff (Ed. ), M4M, volume 194 of Informatik-Berichte (pp. 62–78). Humboldt-Universität zu Berlin. The cited version is http://arxiv.org/abs/0806.4130v1atarXiv.or.